Suede Bath and Body Soap has notes of citrus zest, bergamot, leather, patchouli, birch and tobacco with bottom notes of wood, amber, cedarwood, tonka bean and oakmoss. Suede Bath and Body Soap has notes of citrus zest, bergamot, leather, patchouli, birch and tobacco with bottom notes of wood, amber, cedarwood, tonka bean and oakmoss. Suede artisan bath soap is my latest in the Suede series. It has a matching shaving soap, aftershave balm, cologne and aftershave. My wet shaving customers have been asking for Suede bath and body soap, so they can have a complete set. Now they can and you can too. Suede is a luxury fragrant soap that can be used in the shower or bath. 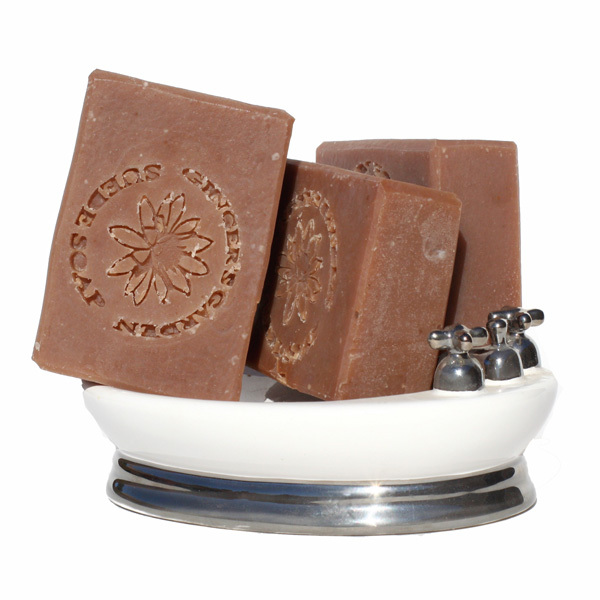 It was made as a cold process soap, so the scent gently lingers on after you use it. Ginger’s Garden cold process soaps are made with natural oils and butters which are gentle to the skin but clean very well. Natural Olive and Coconut Oil, Mango Butter, Castor Oil and beeswax are blended with a custom luxury fragrance. This creates a soap that is gentle and bubbly. Handmade soaps contain the natural goodness of glycerin. Please do not leave the soap in contact with water when it’s not being used. This can make the soap soft. It is best if you let the soap dry between uses and use a draining soap dish. Each batch is made by hand and cut by hand, so there are slight variations in size and weight. Suede bath and body soap weighs approximately 4.8 ozs. It is hand stamped with a logo and comes in a glossy black soap box that can be used for gift giving. Ingredients: Olive oil, Coconut, Palm Kernel, Mango Butter, Castor oil, Soybean, Sodium Hydroxide, Beeswax, Fragrance, Mica.